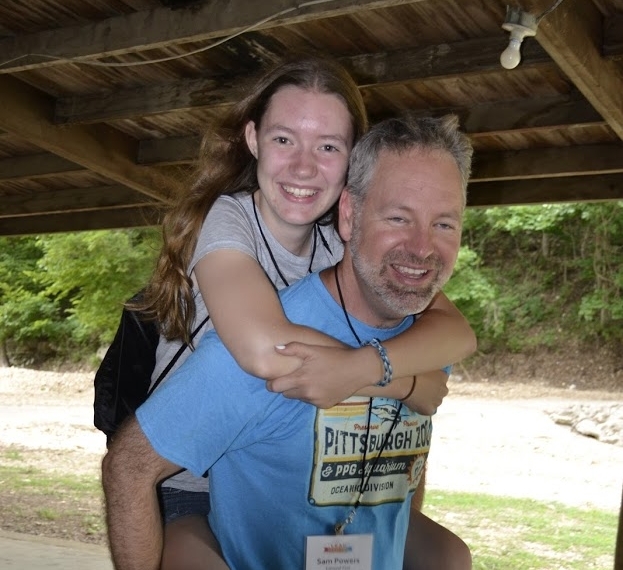 Sam is featured with his daughter, Kyla, who was the student dean in training for Camp Lead this year. Picture taken by Michaela Drain, used by permission. After spending the last two weeks at camp, there is sometimes a perception that pastors “graduate” from needing to be present in that setting. When you get to a certain size of church, there is the sense that you have staff or volunteers in the church to take care of that. I think this comes from the idea that camp is not always easy on the body. Staying in a bunk bed for a week with a cabin filled with teenagers was easier twenty years ago. There are late nights where the lights don’t go off until after midnight. Then there are sunrise hikes to the cross and I seem to have a hard time saying “no” when an adult leader is needed. So I get that camp is tiring. I also don’t think that camp is for everyone. When I was the dean of one of our camps in the late 90’s, Bishop Blake required all clergy to attend at least one camp during the summer. We had an influx of clergy that year and not all of them were happy to be there! In fact, some were more trouble than they were worth. If you are not all in, you probably shouldn’t be at camp. It is not for everyone. Going on a week-long retreat with our young people is helpful to my spirit. It is exciting to me to see them energized for the church. It is fun to see them growing in faith and asking important questions. It is fulfilling to see youth realize a call to ministry and to be at least a small part of that call. Connecting to God through the natural settings is always going to be a part of who I am. Our three United Methodist campgrounds offer three unique settings. Crosspoint is on the lake. Canyon is aptly named. And Egan is adjacent to the Barren Fork creek which is a beautifully clear rocky stream. Hiking at each location is important to me – walking where there is wildlife feeds my soul! I’ll be serving on our conference camps board for the next four years and I hope to begin to help our camps reach more people (and especially be utilized by our churches). As stewards, our camps become healthier financially when they are full throughout the year. Did you know that you can book your own event or private retreat at the camp if the facilities are available for the date you have in mind? While a lot of adults are able to go to camp with us (we send more each year), not everyone can take off a week. We are going to hold an all-church retreat at Canyon Camp this fall from November 2-4. Please hold the date and more details will come (like the fact that we’ll be in the lodge rather than cabins). I realize this won’t be for everyone and that’s okay. But if you feel like it might be for you, we would love to have you join us!